My outfit including my wool coat with fluffy fox fur collar and a fake bob which took more effort than the dress. I recently went to a prohibition night at the Police and Justice Museum in Sydney, Australia. They had turned the museum into a speakeasy with heaps of fun activities, music and performances. Of course they encouraged 1920’s and 30’s dress and so I “whipped up” (because it’s that easy) a flapper dress. I found a gorgeous light satin in green and bought the longest black fringing I could find. I used a 1970’s (Simplicity 8750) bias slip pattern but left out the main darts to have that loose silhouette and added two rows of fringing on the bottom. I also tied the Best Dressed competition so I’m very happy. I had forgotten how fantastic bias cut is to wear and am very tempted to make more bias cut garments. I’m hoping to have a few more photos on my Instagram: http://instagram.com/sharpscissors from the night soon. 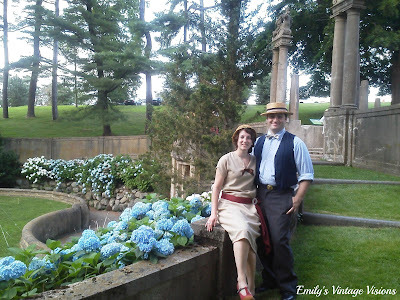 I recently got to pattern test the new Gatsby dress pattern from Heidi&Finn. It’s such an easy, fun sew! I read every post at WeSewRetro, but I rarely get to contribute. I’m sort of sneaking this one in, since it’s a modern pattern and modern fabrics! But there’s a distinctly vintage flavor to this dress that I love. This is a child’s pattern, and I made the biggest size for Isabelle, 10/12. The fabric is crushed panne & stretch lace. That alone is pretty much a sin against vintage sewing, but I had to keep it kid friendly or it wouldn’t get worn! I love the Grecian style fashions that were so popular in the roaring 20s! If you’d like to stop by SewsNBows to see more photos, I’d love a visit! A very quick post today to show you a very quick project. 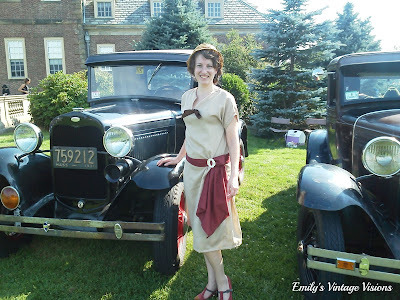 Here is my 1920s dress that I wore to the Roaring 20s Lawn Party at Castle Hill, in Ipswich, Mass. My dress was quickly thrown together in the days leading up to the event. 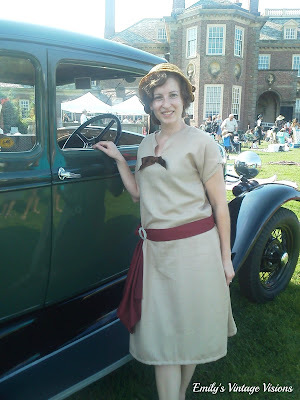 I actually finished sewing the belt and sash in the car on the way to the event. I used a 1920s pattern from my collection but shortened it significantly. I also left off the collar, and added a large box pleat to each side of the dropped waist. The belt and sash were a last minute add on, the dress would have been waaaay too plain without them. I used a vintage buckle on the sash and a little brown bow at the front for a bit of extra detail. I used my vintage wave clips to style my hair, which didn’t turn out as nicely as I had hoped so I kept my hat on all day. 🙂 The event was a lot of fun and the weather was perfect. Couldn’t have asked for a better day! The classic cars and beautiful grounds offered many picture opportunities. There are more pictures posted on my blog. Total cost – Basically nothing. I think I paid around $12.00 for the pattern but it’s been so long I can’t remember.